Don’t they make a lovely couple? Their personalities blend and complement each other yet they keep their own identities. Delightful I think! I’m going to introduce them to a Sea Garden where they can dance amongst cranberry, cherry waves. 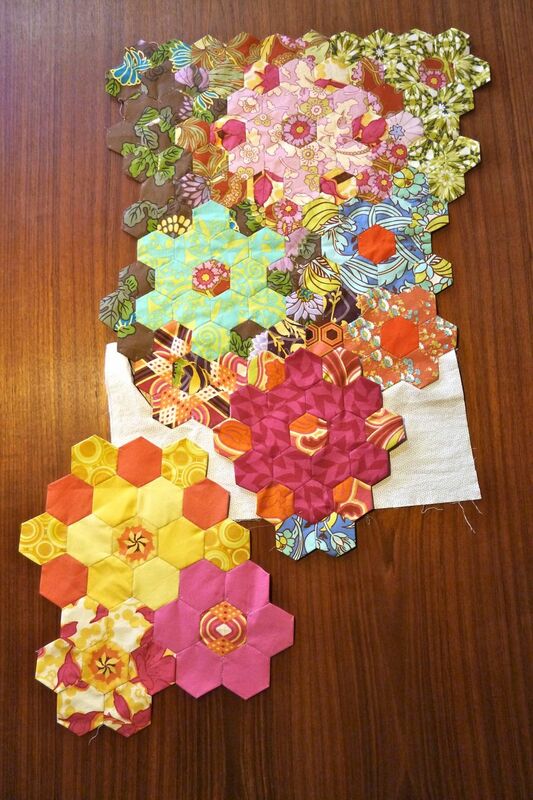 I’ve started woking on my hexies again and I still don’t know what I’m going to make out of them. The nice part about hexies and hand sewing, is you can always remove a piece and replace it, it’s not a rush project, just something that I can take anywhere, especially on the train to and from work and never a waste of time. Okay, okay, this is the last time I’m going to share my bed quilt plans and fabrics until I actually start working on them, probably after Xmas. Here’s what I mean about the German/Austrian style of bed, two duvets on a double, queen or king size bed so you never have to fight over the blankets again. 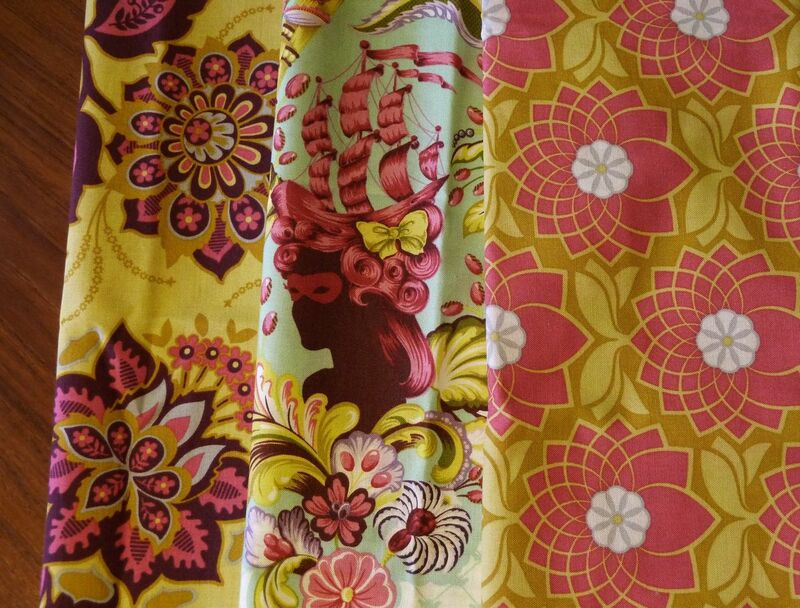 I did a bit of fabric editing, adding more Heirloom and removing Patricia Bravo, Modern Affair, Peacock Eye in Orange — the tone just wasn’t right, I also took out Joel Dewberry’s Flower Fields in Sunset as well as Bloom, Bark which could reappear in a pillow. Now I wait for the rain and cooler weather so I don’t have to feel guilty when I’m in the basement sewing. This entry was posted in Fabric, Germany, Hexies, Inspiration and tagged Aviary 2, Hand Sewing, Joel Dewberry, Joel Dewberry Heirloom, Modern Meadow, Tula Pink Prince Charming by Tabatha. Bookmark the permalink. 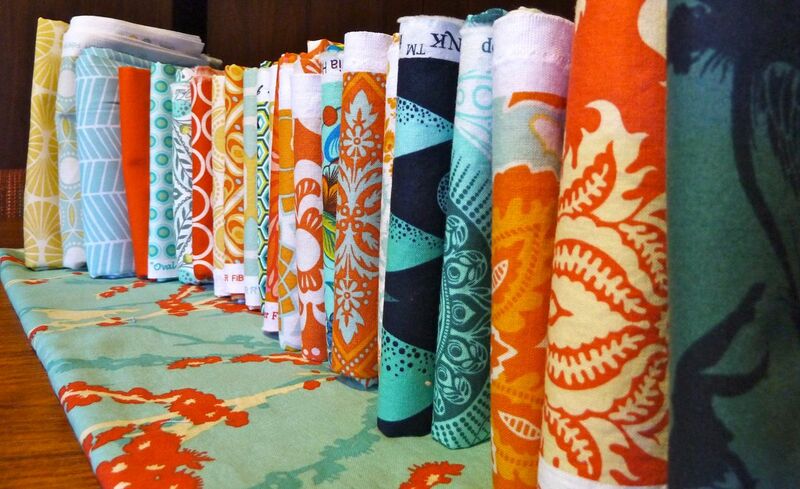 My, oh my, you’ve got a lovely selection of fabric for your bed quilts. Gonna be awesome. Joel and Tula look good together! I love our bed fabrics too but I need some solids, not sure if it’s all too much but I think need something neutral to tone it down?